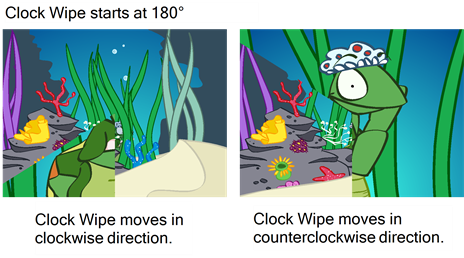 In animation, a scene is the action happening in front of the camera while the camera does not change angle. As long as the camera does not stop "filming", you are in the same scene. To create scenes in a Studio project, you will use the Scene Manager where you can select scenes, create and delete scenes, as well as reorder scenes. When you are satisfied with your scenes, you can add transitions to them. A transition is a change, like a fade, wipe, or cross dissolve, that you can apply between scenes on the Storyline view. You can apply transitions to the beginning or end of a single scene, or between two scenes. 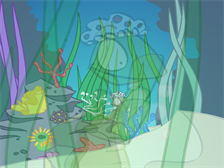 For example, you can use a one-sided transition to fade into a scene at the beginning of your sequence. You can then apply wipes, slides, and cross dissolves between other clips in the Storyline view to move smoothly from one scene to the next. The default transition between scenes is fade in and out. 1. In the Storyline view, select the transition to modify between the scenes. If you removed the existing transition, select the edit point at the beginning or end of the scene, or between two scenes. The edit point is highlighted and red playhead snaps to the location you clicked. 2. In the Properties panel, select a transition from the Type list. By default, Fade is the default setting. 3. In the Properties panel, edit the transition properties. 4. Enter the Duration (in frames) for the transition. If you select the Fade transition, you must enter the Left Duration, Blank Duration, and Duration Right. 5. The transition appears in the Storyline view. 6. In the Storyline view, click the Play Storyline button. The transition's properties are displayed in the Properties panel. 2. From the Type list, select No Transition. There are six different transitions to choose from in Studio. Once you apply a transition, you can edit its properties to get just the right look for your project. The Fade transition lets you adjust the video levels to fade in or fade out a clip. You can also specify the colour from which the scene fades in or to which it fades out. Left Duration: The number of frames at the beginning of the transition. Colour: Opens the colour picker so you can select the colour of the transition. Blank Duration: The number of blank frames at the end of the transition. The Wipe effect transition lets you create a transition between two scenes, such that the second clip is revealed according to a specified pattern. Duration: The number of frames the transition lasts. Angle: Let you set the angle at which the transition starts, from 0° to 359°. Direction: The direction the transition is moving towards: In or Out. In the In direction, the transition moves towards the left. In the Out direction, the transition moves towards the right. The Slide transition lets you show the outgoing scene moving upwards to reveal the incoming scene. 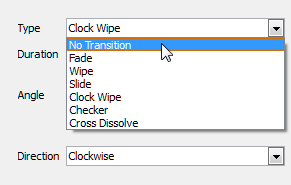 The Clock Wipe transition lets you create a wipe transition that moves clockwise or counterclockwise. Direction: The direction the transition is moving: Clockwise or Counterclockwise. The Checker transition lets you create a transition that resembles a checkerboard. You can change the size and colour of the checkerboard tiles. Size: Lets you adjust the size of the checkboard tiles. Drag left for smaller tiles and drag right for larger ones. The Cross Dissolve transition lets you between scenes in which the image from one scene gradually becomes less distinct as the image from the other scene replaces it.